“Morphia” redirects here. For other uses, see Morphia (disambiguation) and Morphine (disambiguation). Morphine is a pain medication of the opiate family which is found naturally in a number of plants and animals. It acts directly on the central nervous system (CNS) to decrease the feeling of pain. It can be taken for both acute pain and chronic pain. It is frequently used for pain from myocardial infarction and during labor. It can be given by mouth, by injection into a muscle, by injection under the skin, intravenously, injection into the space around the spinal cord, or rectally. Maximum effect is reached after about 20 minutes when given intravenously and after 60 minutes when given by mouth, while duration of effect is 3–7 hours. Long-acting formulations also exist. Potentially serious side effects include decreased respiratory effort and low blood pressure. Morphine is addictive and prone to abuse. If the dose is reduced after long-term use, opioid withdrawal symptoms may occur. Common side effects include drowsiness, vomiting, and constipation. Caution is advised when used during pregnancy or breast feeding, as morphine may affect the baby. Morphine was first isolated between 1803 and 1805 by Friedrich Sertürner. This is generally believed to be the first isolation of an active ingredient from a plant. Merck began marketing it commercially in 1827. Morphine was more widely used after the invention of the hypodermic syringe in 1853–1855. Sertürner originally named the substance morphium after the Greek god of dreams, Morpheus, as it has a tendency to cause sleep. The primary source of morphine is isolation from poppy straw of the opium poppy. In 2013, approximately 523 tons of morphine were produced. Approximately 45 tons were used directly for pain, a four-fold increase over the last twenty years. Most use for this purpose was in the developed world. About 70 percent of morphine is used to make other opioids such as hydromorphone, oxymorphone, and heroin. It is a Schedule II drug in the United States, Class A in the United Kingdom, and Schedule I in Canada. It is on the World Health Organization’s List of Essential Medicines, the most effective and safe medicines needed in a health system. Morphine is sold under many trade names. In 2016, it was the 158th most prescribed medication in the United States, with more than 3 million prescriptions. Morphine is used primarily to treat both acute and chronic severe pain. It is also used for pain due to myocardial infarction and for labor pains. Its duration of analgesia is about three to seven hours. However, concerns exist that morphine may increase mortality in the event of non ST elevation myocardial infarction. Morphine has also traditionally been used in the treatment of acute pulmonary edema. A 2006 review, though, found little evidence to support this practice. A 2016 Cochrane review concluded that morphine is effective in relieving cancer pain. Side-effects of nausea and constipation are rarely severe enough to warrant stopping treatment. Morphine is beneficial in reducing the symptom of shortness of breath due to both cancer and noncancer causes. In the setting of breathlessness at rest or on minimal exertion from conditions such as advanced cancer or end-stage cardiorespiratory diseases, regular, low-dose sustained-release morphine significantly reduces breathlessness safely, with its benefits maintained over time. Morphine is also available as a slow-release formulation for opiate substitution therapy (OST) in Austria, Bulgaria, and Slovenia, for addicts who cannot tolerate either methadone or buprenorphine. 1 milliliter vial containing 10 mg of morphine. Clinical studies consistently conclude that morphine, like other opioids, often causes hypogonadism and hormone imbalances in chronic users of both sexes. This side effect is dose-dependent and occurs in both therapeutic and recreational users. Morphine can interfere with menstruation in women by suppressing levels of luteinizing hormone. Many studies suggest the majority (perhaps as many as 90%) of chronic opioid users have opioid-induced hypogonadism. This effect may cause the increased likelihood of osteoporosis and bone fracture observed in chronic morphine users. Studies suggest the effect is temporary. As of 2013[update], the effect of low-dose or acute use of morphine on the endocrine system is unclear. Most reviews conclude that opioids produce minimal impairment of human performance on tests of sensory, motor, or attentional abilities. However, recent studies have been able to show some impairments caused by morphine, which is not surprising, given that morphine is a central nervous system depressant. Morphine has resulted in impaired functioning on critical flicker frequency (a measure of overall CNS arousal) and impaired performance on the Maddox wing test (a measure of the deviation of the visual axes of the eyes). Few studies have investigated the effects of morphine on motor abilities; a high dose of morphine can impair finger tapping and the ability to maintain a low constant level of isometric force (i.e. fine motor control is impaired), though no studies have shown a correlation between morphine and gross motor abilities. In chronic opioid users, such as those on Chronic Opioid Analgesic Therapy (COAT) for managing severe, chronic pain, behavioural testing has shown normal functioning on perception, cognition, coordination and behaviour in most cases. One 2000 study analysed COAT patients to determine whether they were able to safely operate a motor vehicle. The findings from this study suggest that stable opioid use does not significantly impair abilities inherent in driving (this includes physical, cognitive and perceptual skills). COAT patients showed rapid completion of tasks that require the speed of responding for successful performance (e.g., Rey Complex Figure Test) but made more errors than controls. COAT patients showed no deficits in visual-spatial perception and organization (as shown in the WAIS-R Block Design Test) but did show impaired immediate and short-term visual memory (as shown on the Rey Complex Figure Test – Recall). These patients showed no impairments in higher-order cognitive abilities (i.e., planning). COAT patients appeared to have difficulty following instructions and showed a propensity toward impulsive behaviour, yet this did not reach statistical significance. It is important to note that this study reveals that COAT patients have no domain-specific deficits, which supports the notion that chronic opioid use has minor effects on psychomotor, cognitive, or neuropsychological functioning. Morphine is a highly addictive substance. In controlled studies comparing the physiological and subjective effects of heroin and morphine in individuals formerly addicted to opiates, subjects showed no preference for one drug over the other. Equipotent, injected doses had comparable action courses, with no difference in subjects’ self-rated feelings of euphoria, ambition, nervousness, relaxation, drowsiness, or sleepiness. Short-term addiction studies by the same researchers demonstrated that tolerance developed at a similar rate to both heroin and morphine. When compared to the opioids hydromorphone, fentanyl, oxycodone, and pethidine/meperidine, former addicts showed a strong preference for heroin and morphine, suggesting that heroin and morphine are particularly susceptible to abuse and addiction. Morphine and heroin were also much more likely to produce euphoria and other positive subjective effects when compared to these other opioids. The choice of heroin and morphine over other opioids by former drug addicts may also be because heroin (also known as morphine diacetate, diamorphine, or diacetyl morphine) is an ester of morphine and a morphine prodrug, essentially meaning they are identical drugs in vivo. Heroin is converted to morphine before binding to the opioid receptors in the brain and spinal cord, where morphine causes the subjective effects, which is what the addicted individuals are seeking. Several hypotheses are given about how tolerance develops, including opioid receptor phosphorylation (which would change the receptor conformation), functional decoupling of receptors from G-proteins (leading to receptor desensitization), μ-opioid receptor internalization or receptor down-regulation (reducing the number of available receptors for morphine to act on), and upregulation of the cAMP pathway (a counterregulatory mechanism to opioid effects) (For a review of these processes, see Koch and Hollt.) CCK might mediate some counter-regulatory pathways responsible for opioid tolerance. CCK-antagonist drugs, specifically proglumide, have been shown to slow the development of tolerance to morphine. The withdrawal symptoms associated with morphine addiction are usually experienced shortly before the time of the next scheduled dose, sometimes within as early as a few hours (usually 6 h to 12 h) after the last administration. Early symptoms include watery eyes, insomnia, diarrhea, runny nose, yawning, dysphoria, sweating, and in some cases a strong drug craving. Severe headache, restlessness, irritability, loss of appetite, body aches, severe abdominal pain, nausea and vomiting, tremors, and even stronger and more intense drug craving appear as the syndrome progresses. Severe depression and vomiting are very common. During the acute withdrawal period, systolic and diastolic blood pressures increase, usually beyond premorphine levels, and heart rate increases, which have potential to cause a heart attack, blood clot, or stroke. Chills or cold flashes with goose bumps (“cold turkey“) alternating with flushing (hot flashes), kicking movements of the legs (“kicking the habit”) and excessive sweating are also characteristic symptoms. Severe pains in the bones and muscles of the back and extremities occur, as do muscle spasms. At any point during this process, a suitable narcotic can be administered that will dramatically reverse the withdrawal symptoms. Major withdrawal symptoms peak between 48 h and 96 h after the last dose and subside after about 8 to 12 days. Sudden withdrawal by heavily dependent users who are in poor health is very rarely fatal. Morphine withdrawal is considered less dangerous than alcohol, barbiturate, or benzodiazepine withdrawal. The psychological dependence associated with morphine addiction is complex and protracted. Long after the physical need for morphine has passed, the addict will usually continue to think and talk about the use of morphine (or other drugs) and feel strange or overwhelmed coping with daily activities without being under the influence of morphine. Psychological withdrawal from morphine is usually a very long and painful process. [unreliable medical source] Addicts often suffer severe depression, anxiety, insomnia, mood swings, amnesia (forgetfulness), low self-esteem, confusion, paranoia, and other psychological disorders. Without intervention, the syndrome will run its course, and most of the overt physical symptoms will disappear within 7 to 10 days including psychological dependence. A high probability of relapse exists after morphine withdrawal when neither the physical environment nor the behavioral motivators that contributed to the abuse have been altered. Testimony to morphine’s addictive and reinforcing nature is its relapse rate. Abusers of morphine (and heroin) have one of the highest relapse rates among all drug users, ranging up to 98% in the estimation of some medical experts. A large overdose can cause asphyxia and death by respiratory depression if the person does not receive medical attention immediately. Overdose treatment includes the administration of naloxone. The latter completely reverses morphine’s effects, but may result in immediate onset of withdrawal in opiate-addicted subjects. Multiple doses may be needed. The minimum lethal dose of morphine sulfate is 120 mg, but in case of hypersensitivity, 60 mg can bring sudden death. In serious drug dependency (high tolerance), 2000–3000 mg per day can be tolerated. Morphine is the prototypical opioid and is the standard against which other opioids are tested. It interacts predominantly with the μ–δ-opioid (Mu-Delta) receptor heteromer. The μ-binding sites are discretely distributed in the human brain, with high densities in the posterior amygdala, hypothalamus, thalamus, nucleus caudatus, putamen, and certain cortical areas. They are also found on the terminal axons of primary afferents within laminae I and II (substantia gelatinosa) of the spinal cord and in the spinal nucleus of the trigeminal nerve. Morphine is a phenanthrene opioid receptor agonist – its main effect is binding to and activating the μ-opioid receptor (MOR) in the central nervous system. Its intrinsic activity at the MOR is heavily dependent on the assay and tissue being tested; in some situations it is a full agonist while in others it can be a partial agonist or even antagonist. In clinical settings, morphine exerts its principal pharmacological effect on the central nervous system and gastrointestinal tract. Its primary actions of therapeutic value are analgesia and sedation. Activation of the MOR is associated with analgesia, sedation, euphoria, physical dependence, and respiratory depression. Morphine is also a κ-opioid receptor (KOR) and δ-opioid receptor (DOR) agonist. Activation of the KOR is associated with spinal analgesia, miosis (pinpoint pupils), and psychotomimetic effects. The DOR is thought to play a role in analgesia. Although morphine does not bind to the σ receptor, it has been shown that σ receptor agonists, such as (+)-pentazocine, inhibit morphine analgesia, and σ receptor antagonists enhance morphine analgesia, suggesting downstream involvement of the σ receptor in the actions of morphine. The effects of morphine can be countered with opioid receptor antagonists such as naloxone and naltrexone; the development of tolerance to morphine may be inhibited by NMDA receptor antagonists such as ketamine or dextromethorphan. The rotation of morphine with chemically dissimilar opioids in the long-term treatment of pain will slow down the growth of tolerance in the longer run, particularly agents known to have significantly incomplete cross-tolerance with morphine such as levorphanol, ketobemidone, piritramide, and methadone and its derivatives; all of these drugs also have NMDA antagonist properties. It is believed that the strong opioid with the most incomplete cross-tolerance with morphine is either methadone or dextromoramide. Morphine has long been known to act on receptors expressed on cells of the central nervous system resulting in pain relief and analgesia. In the 1970s and ’80s, evidence suggesting that opioid drug addicts show increased risk of infection (such as increased pneumonia, tuberculosis, and HIV/AIDS) led scientists to believe that morphine may also affect the immune system. This possibility increased interest in the effect of chronic morphine use on the immune system. Further studies on the effects of morphine on the immune system have shown that morphine influences the production of neutrophils and other cytokines. Since cytokines are produced as part of the immediate immunological response (inflammation), it has been suggested that they may also influence pain. In this way, cytokines may be a logical target for analgesic development. Recently, one study has used an animal model (hind-paw incision) to observe the effects of morphine administration on the acute immunological response. Following hind-paw incision, pain thresholds and cytokine production were measured. Normally, cytokine production in and around the wounded area increases in order to fight infection and control healing (and, possibly, to control pain), but pre-incisional morphine administration (0.1 mg/kg to 10.0 mg/kg) reduced the number of cytokines found around the wound in a dose-dependent manner. The authors suggest that morphine administration in the acute post-injury period may reduce resistance to infection and may impair the healing of the wound. Morphine can be taken orally, sublingually, bucally, rectally, subcutaneously, intranasally, intravenously, intrathecally or epidurally and inhaled via a nebulizer. As a recreational drug, it is becoming more common to inhale (“Chasing the Dragon“), but, for medical purposes, intravenous (IV) injection is the most common method of administration. Morphine is subject to extensive first-pass metabolism (a large proportion is broken down in the liver), so, if taken orally, only 40% to 50% of the dose reaches the central nervous system. Resultant plasma levels after subcutaneous (SC), intramuscular (IM), and IV injection are all comparable. After IM or SC injections, morphine plasma levels peak in approximately 20 min, and, after oral administration, levels peak in approximately 30 min. Morphine is metabolised primarily in the liver and approximately 87% of a dose of morphine is excreted in the urine within 72 h of administration. Morphine is metabolized primarily into morphine-3-glucuronide (M3G) and morphine-6-glucuronide (M6G) via glucuronidation by phase II metabolism enzyme UDP-glucuronosyl transferase-2B7 (UGT2B7). About 60% of morphine is converted to M3G, and 6% to 10% is converted to M6G. Not only does the metabolism occur in the liver but it may also take place in the brain and the kidneys. M3G does not undergo opioid receptor binding and has no analgesic effect. M6G binds to μ-receptors and is half as potent an analgesic as morphine in humans. Morphine may also be metabolized into small amounts of normorphine, codeine, and hydromorphone. Metabolism rate is determined by gender, age, diet, genetic makeup, disease state (if any), and use of other medications. The elimination half-life of morphine is approximately 120 min, though there may be slight differences between men and women. Morphine can be stored in fat, and, thus, can be detectable even after death. Morphine can cross the blood–brain barrier, but, because of poor lipid solubility, protein binding, rapid conjugation with glucuronic acid and ionization, it does not cross easily. 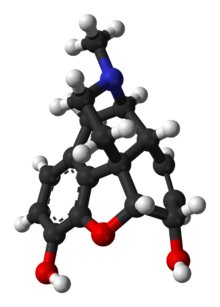 Diacetylmorphine, which is derived from morphine, crosses the blood–brain barrier more easily, making it more potent. There are extended-release formulations of orally administered morphine whose effect last longer, which can be given once per day. Brand names for this formulation of morphine include Avinza, Kadian, MS Contin and Dolcontin. For constant pain, the relieving effect of extended-release morphine given once (for Kadian) or twice (for MS Contin) every 24 hours is roughly the same as multiple administrations of immediate release (or “regular”) morphine. Extended-release morphine can be administered together with “rescue doses” of immediate-release morphine as needed in case of breakthrough pain, each generally consisting of 5% to 15% of the 24-hour extended-release dosage. Morphine is the most abundant opiate found in opium, the dried latex extracted by shallowly scoring the unripe seedpods of the Papaver somniferum poppy. Morphine is generally 8–14% of the dry weight of opium, although specially bred cultivars reach 26% or produce little morphine at all (under 1%, perhaps down to 0.04%). The latter varieties, including the ‘Przemko’ and ‘Norman’ cultivars of the opium poppy, are used to produce two other alkaloids, thebaine and oripavine, which are used in the manufacture of semi-synthetic and synthetic opioids like oxycodone and etorphine and some other types of drugs. P. bracteatum does not contain morphine or codeine, or other narcotic phenanthrene-type, alkaloids. This species is rather a source of thebaine. Occurrence of morphine in other Papaverales and Papaveraceae, as well as in some species of hops and mulberry trees has not been confirmed. Morphine is produced most predominantly early in the life cycle of the plant. 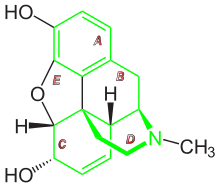 Past the optimum point for extraction, various processes in the plant produce codeine, thebaine, and in some cases negligible amounts of hydromorphone, dihydromorphine, dihydrocodeine, tetrahydro-thebaine, and hydrocodone (these compounds are rather synthesized from thebaine and oripavine). In the brain of mammals, morphine is detectable in trace steady-state concentrations. The human body also produces endorphins, which are chemically related endogenous opioid peptides that function as neuropeptides and have similar effects to morphine. 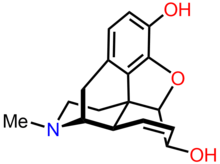 (S)-Norlaudanosoline (also known as tetrahydropapaveroline) can also be synthesized from 3,4-dihydroxyphenylacetaldehyde (DOPAL), a metabolite of L-DOPA and dopamine. Urinary concentrations of endogenous codeine and morphine have been found to significantly increase in individuals taking L-DOPA for the treatment of Parkinson’s disease. Morphine is biosynthesized in the opium poppy from the tetrahydroisoquinoline reticuline. It is converted into salutaridine, thebaine, and oripavine. The enzymes involved in this process are the salutaridine synthase, salutaridine:NADPH 7-oxidoreductase and the codeinone reductase. Researchers are attempting to reproduce the biosynthetic pathway that produces morphine in genetically engineered yeast. In June 2015 the S-reticuline could be produced from sugar and R-reticuline could be converted to morphine, but the intermediate reaction could not be performed. In August 2015 the first complete synthesis of thebaine and hydrocodone in yeast were reported, but the process would need to be 100,000 times more productive to be suitable for commercial use. Same structure as a three-dimensional perspective drawing. A rigid pentacyclic structure consisting of a benzene ring (A), two partially unsaturated cyclohexane rings (B and C), a piperidine ring (D) and a tetrahydrofuran ring (E). Rings A, B and C are the phenanthrene ring system. This ring system has little conformational flexibility. Most of the licit morphine produced is used to make codeine by methylation. It is also a precursor for many drugs including heroin (3,6-diacetylmorphine), hydromorphone (dihydromorphinone), and oxymorphone (14-hydroxydihydromorphinone); many morphine derivatives can also be manufactured using thebaine or codeine as a starting material. Replacement of the N-methyl group of morphine with an N-phenylethyl group results in a product that is 18 times more powerful than morphine in its opiate agonist potency. Combining this modification with the replacement of the 6-hydroxyl with a 6-methylene group produces a compound some 1,443 times more potent than morphine, stronger than the Bentley compounds such as etorphine (M99, the Immobilon tranquilliser dart) by some measures. The structure-activity relationship of morphine has been extensively studied. As a result of the extensive study and use of this molecule, more than 250 morphine derivatives (also counting codeine and related drugs) have been developed since the last quarter of the 19th century. These drugs range from 25% the analgesic strength of codeine (or slightly more than 2% of the strength of morphine) to several thousand times the strength of morphine, to powerful opioid antagonists, including naloxone (Narcan), naltrexone (Trexan), diprenorphine (M5050, the reversing agent for the Immobilon dart) and nalorphine (Nalline). Some opioid agonist-antagonists, partial agonists, and inverse agonists are also derived from morphine. The receptor-activation profile of the semi-synthetic morphine derivatives varies widely and some, like apomorphine are devoid of narcotic effects. Halogenating or making other modifications at positions 1 or 2 on the morphine carbon skeleton. Saturating, opening, or other changes to the bond between positions 7 and 8, as well as adding, removing, or modifying functional groups to these positions; saturating, reducing, eliminating, or otherwise modifying the 7–8 bond and attaching a functional group at 14 yields hydromorphinol; the oxidation of the hydroxyl group to a carbonyl and changing the 7–8 bond to single from double changes codeine into oxycodone. A number of salts of morphine are used, with the most common in current clinical use being the hydrochloride, sulfate, tartrate, and citrate; less commonly methobromide, hydrobromide, hydroiodide, lactate, chloride, and bitartrate and the others listed below. Morphine diacetate, which is another name for heroin, is a Schedule I controlled substance, so it is not used clinically in the United States; it is a sanctioned medication in the United Kingdom and in Canada and some countries in Continental Europe, its use being particularly common (nearly to the degree of the hydrochloride salt) in the United Kingdom. 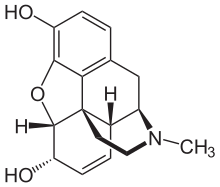 Morphine meconate is a major form of the alkaloid in the poppy, as is morphine pectinate, nitrate, sulfate, and some others. Like codeine, dihydrocodeine and other (especially older) opiates, morphine has been used as the salicylate salt by some suppliers and can be easily compounded, imparting the therapeutic advantage of both the opioid and the NSAID; multiple barbiturate salts of morphine were also used in the past, as was/is morphine valerate, the salt of the acid being the active principle of valerian. Calcium morphenate is the intermediate in various latex and poppy-straw methods of morphine production, more rarely sodium morphenate takes its place. Morphine ascorbate and other salts such as the tannate, citrate, and acetate, phosphate, valerate and others may be present in poppy tea depending on the method of preparation. Morphine valerate produced industrially was one ingredient of a medication available for both oral and parenteral administration popular many years ago in Europe and elsewhere called Trivalin (not to be confused with the current, unrelated herbal preparation of the same name), which also included the valerates of caffeine and cocaine, with a version containing codeine valerate as a fourth ingredient being distributed under the name Tetravalin. The first morphine total synthesis, devised by Marshall D. Gates, Jr. in 1952, remains a widely used example of total synthesis. Several other syntheses were reported, notably by the research groups of Rice, Evans, Fuchs, Parker, Overman, Mulzer-Trauner, White, Taber, Trost, Fukuyama, Guillou, and Stork. It is “highly unlikely” that a chemical synthesis will ever be able to compete with the cost of producing morphine from the opium poppy. In the opium poppy, the alkaloids are bound to meconic acid. The method is to extract from the crushed plant with diluted sulfuric acid, which is a stronger acid than meconic acid, but not so strong to react with alkaloid molecules. The extraction is performed in many steps (one amount of crushed plant is extracted at least six to ten times, so practically every alkaloid goes into the solution). From the solution obtained at the last extraction step, the alkaloids are precipitated by either ammonium hydroxide or sodium carbonate. The last step is purifying and separating morphine from other opium alkaloids. The somewhat similar Gregory process was developed in the United Kingdom during the Second World War, which begins with stewing the entire plant, in most cases save the roots and leaves, in plain or mildly acidified water, then proceeding through steps of concentration, extraction, and purification of alkaloids. Other methods of processing “poppy straw” (i.e., dried pods and stalks) use steam, one or more of several types of alcohol, or other organic solvents. Opium poppy contains at least 50 different alkaloids, but most of them are of very low concentration. Morphine is the principal alkaloid in raw opium and constitutes roughly 8–19% of opium by dry weight (depending on growing conditions). Some purpose-developed strains of poppy now produce opium that is up to 26% morphine by weight. A rough rule of thumb to determine the morphine content of pulverised dried poppy straw is to divide the percentage expected for the strain or crop via the latex method by eight or an empirically determined factor, which is often in the range of 5 to 15. The Norman strain of P. Somniferum, also developed in Tasmania, produces down to 0.04% morphine but with much higher amounts of thebaine and oripavine, which can be used to synthesise semi-synthetic opioids as well as other drugs like stimulants, emetics, opioid antagonists, anticholinergics, and smooth-muscle agents. In the 1950s and 1960s, Hungary supplied nearly 60% of Europe’s total medication-purpose morphine production. To this day, poppy farming is legal in Hungary, but poppy farms are limited by law to 2 acres (8,100 m2). It is also legal to sell dried poppy in flower shops for use in floral arrangements. Morphine is a precursor in the manufacture in a large number of opioids such as dihydromorphine, hydromorphone, hydrocodone, and oxycodone as well as codeine, which itself has a large family of semi-synthetic derivatives. Morphine is commonly treated with acetic anhydride and ignited to yield heroin. Throughout Europe there is growing acceptance within the medical community of the use of slow release oral morphine as a substitution treatment alternative to methadone and buprenorphine for patients not able to tolerate the side-effects of buprenorphine and methadone. Slow-release oral morphine has been in widespread use for opiate maintenance therapy in Austria, Bulgaria, and Slovakia for many years and it is available on a small scale in many other countries including the UK. The long-acting nature of slow-release morphine mimics that of buprenorphine because the sustained blood levels are relatively flat so there is no “high” per se that a patient would feel but rather a sustained feeling of wellness and avoidance of withdrawal symptoms. For patients sensitive to the side-effects that in part may be a result of the unnatural pharmacological actions of buprenorphine and methadone, slow-release oral morphine formulations offer a promising future for use managing opiate addiction. The pharmacology of heroin and morphine is identical except the two acetyl groups increase the lipid solubility of the heroin molecule, causing heroin to cross the blood–brain barrier and enter the brain more rapidly in injection. Once in the brain, these acetyl groups are removed to yield morphine, which causes the subjective effects of heroin. Thus, heroin may be thought of as a more rapidly acting form of morphine. An opium-based elixir has been ascribed to alchemists of Byzantine times, but the specific formula was lost during the Ottoman conquest of Constantinople (Istanbul). Around 1522, Paracelsus made reference to an opium-based elixir that he called laudanum from the Latin word laudare, meaning “to praise” He described it as a potent painkiller, but recommended that it be used sparingly. In the late eighteenth century, when the East India Company gained a direct interest in the opium trade through India, another opiate recipe called laudanum became very popular among physicians and their patients. The drug was first marketed to the general public by Sertürner and Company in 1817 as a pain medication, and also as a treatment for opium and alcohol addiction. It was first used as a poison in 1822 when Dr. Edme Castaing of France was convicted of murdering a patient. Commercial production began in Darmstadt, Germany in 1827 by the pharmacy that became the pharmaceutical company Merck, with morphine sales being a large part of their early growth. In the 1850s, Alexander Wood reported that he had injected morphine into his wife Rebecca as an experiment; the myth goes that this killed her because of respiratory depression, but she outlived her husband by ten years. Later it was found that morphine was more addictive than either alcohol or opium, and its extensive use during the American Civil War allegedly resulted in over 400,000 sufferers from the “soldier’s disease” of morphine addiction. This idea has been a subject of controversy, as there have been suggestions that such a disease was in fact a fabrication; the first documented use of the phrase “soldier’s disease” was in 1915. 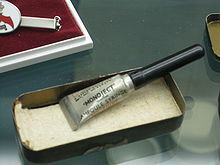 An ampoule of morphine with integral needle for immediate use. Also known as a “syrette”. From WWII. On display at the Army Medical Services Museum. Morphine became a controlled substance in the US under the Harrison Narcotics Tax Act of 1914, and possession without a prescription in the US is a criminal offense. Morphine was the most commonly abused narcotic analgesic in the world until heroin was synthesized and came into use. In general, until the synthesis of dihydromorphine (ca. 1900), the dihydromorphinone class of opioids (1920s), and oxycodone (1916) and similar drugs, there were no other drugs in the same efficacy range as opium, morphine, and heroin, with synthetics still several years away (pethidine was invented in Germany in 1937) and opioid agonists among the semi-synthetics were analogues and derivatives of codeine such as dihydrocodeine (Paracodin), ethylmorphine (Dionine), and benzylmorphine (Peronine). Even today, morphine is the most sought after prescription narcotic by heroin addicts when heroin is scarce, all other things being equal; local conditions and user preference may cause hydromorphone, oxymorphone, high-dose oxycodone, or methadone as well as dextromoramide in specific instances such as 1970s Australia, to top that particular list. The stop-gap drugs used by the largest absolute number of heroin addicts is probably codeine, with significant use also of dihydrocodeine, poppy straw derivatives like poppy pod and poppy seed tea, propoxyphene, and tramadol. The structural formula of morphine was determined by 1925 by Robert Robinson. At least three methods of total synthesis of morphine from starting materials such as coal tar and petroleum distillates have been patented, the first of which was announced in 1952, by Dr. Marshall D. Gates, Jr. at the University of Rochester. Still, the vast majority of morphine is derived from the opium poppy by either the traditional method of gathering latex from the scored, unripe pods of the poppy, or processes using poppy straw, the dried pods and stems of the plant, the most widespread of which was invented in Hungary in 1925 and announced in 1930 by Hungarian pharmacologist János Kabay. In France, morphine is in the strictest schedule of controlled substances, based upon the December 1970 French controlled substances law. In Germany, morphine is a verkehrsfähiges und verschreibungsfähiges Betäubungsmittel listed under Anlage III (the equivalent of CSA Schedule II) of the Betäubungsmittelgesetz. In Switzerland, morphine is similarly scheduled to Germany’s legal classification of the drug. In Japan, morphine is classified as a narcotic under the Narcotics and Psychotropics Control Act (麻薬及び向精神薬取締法, mayaku oyobi kōseishinyaku torishimarihō). In the United States, morphine is classified as a Schedule II controlled substance under the Controlled Substances Act under main Administrative Controlled Substances Code Number 9300. Morphine pharmaceuticals are subject to annual manufacturing quotas; in 2017 these quotas were 35.0 tonnes of production for sale, and 27.3 tonnes of production as an intermediate, or chemical precursor, for conversion into other drugs. Morphine produced for use in extremely dilute formulations is excluded from the manufacturing quota. Internationally (UN), morphine is a Schedule I drug under the Single Convention on Narcotic Drugs. Informal names for morphine include: Cube Juice, Dope, Dreamer, Emsel, First Line, God’s Drug, Hard Stuff, Hocus, Hows, Lydia, Lydic, M, Miss Emma, Mister Blue, Monkey, Morf, Morph, Morphide, Morphie, Morpho, Mother, MS, Ms. Emma, Mud, New Jack Swing (if mixed with heroin), Sister, Tab, Unkie, Unkie White, and Stuff. MS Contin tablets are known as misties, and the 100 mg extended-release tablets as greys and blockbusters. The “speedball” can use morphine as the opioid component, which is combined with cocaine, amphetamines, methylphenidate, or similar drugs. “Blue Velvet” is a combination of morphine with the antihistamine tripelennamine (Pyrabenzamine, PBZ, Pelamine) taken by injection, or less commonly the mixture when swallowed or used as a retention enema; the name is also known to refer to a combination of tripelennamine and dihydrocodeine or codeine tablets or syrups taken by mouth. “Morphia” is an older official term for morphine also used as a slang term. “Driving Miss Emma” is intravenous administration of morphine. Multi-purpose tablets (readily soluble hypodermic tablets that can also be swallowed or dissolved under the tongue or betwixt the cheek and jaw) are known, as are some brands of hydromorphone, as Shake & Bake or Shake & Shoot. Morphine can be smoked, especially diacetylmorphine (heroin), the most common method being the “Chasing The Dragon” method. To perform a relatively crude acetylation to turn the morphine into heroin and related drugs immediately prior to use is known as AAing (for Acetic Anhydride) or home-bake, and the output of the procedure also known as home-bake or, Blue Heroin (not to be confused with Blue Magic heroin, or the linctus known as Blue Morphine or Blue Morphone, or the Blue Velvet mixture described above). Morphine is marketed under many different brand names in various parts of the world. Although morphine is cheap, people in poorer countries often do not have access to it. According to a 2005 estimate by the International Narcotics Control Board, six countries (Australia, Canada, France, Germany, the United Kingdom, and the United States) consume 79% of the world’s morphine. The less affluent countries, accounting for 80% of the world’s population, consumed only about 6% of the global morphine supply. Some countries[which?] import virtually no morphine, and in others[which?] the drug is rarely available even for relieving severe pain while dying. Experts in pain management attribute the under-distribution of morphine to an unwarranted fear of the drug’s potential for addiction and abuse. While morphine is clearly addictive, Western doctors believe it is worthwhile to use the drug and then wean the patient off when the treatment is over. ^ Jonsson T, Christensen CB, Jordening H, Frølund C (April 1988). “The bioavailability of rectally administered morphine”. Pharmacol. Toxicol. 62 (4): 203–5. doi:10.1111/j.1600-0773.1988.tb01872.x. PMID 3387374. ^ Whimster, Fiona (1997). Cambridge textbook of accident and emergency medicine. Cambridge: Cambridge University Press. p. 191. ISBN 978-0-521-43379-2. Archived from the original on 8 September 2017. ^ Liben, Stephen (2012). Oxford textbook of palliative care for children (2 ed.). Oxford: Oxford University Press. p. 240. ISBN 978-0-19-959510-5. Archived from the original on 8 September 2017. ^ a b c d e f g h i j k l m n o p “Morphine sulfate”. The American Society of Health-System Pharmacists. Archived from the original on 2 May 2015. Retrieved 1 June 2015. ^ a b c Rockwood, Charles A. (2009). Rockwood and Wilkins’ fractures in children (7th ed.). Philadelphia, Pa.: Lippincott Williams & Wilkins. p. 54. ISBN 978-1-58255-784-7. Archived from the original on 8 September 2017. ^ a b c d e f g Stefano GB, Ptáček R, Kuželová H, Kream RM (2012). “Endogenous morphine: up-to-date review 2011” (PDF). Folia Biol. (Praha). 58 (2): 49–56. PMID 22578954. Archived (PDF) from the original on 24 August 2016. Positive evolutionary pressure has apparently preserved the ability to synthesize chemically authentic morphine, albeit in homeopathic concentrations, throughout animal phyla. ^ a b c Courtwright, David T. (2009). Forces of habit drugs and the making of the modern world (1 ed.). Cambridge, Mass. : Harvard University Press. pp. 36–37. ISBN 978-0-674-02990-3. Archived from the original on 8 September 2017. ^ a b Luch A, ed. (2009). Molecular, clinical and environmental toxicology. Springer. p. 20. ISBN 978-3-7643-8335-0. ^ a b c Clayton J. Mosher (2013). Drugs and Drug Policy: The Control of Consciousness Alteration. SAGE Publications. p. 123. ISBN 978-1-4833-2188-2. Archived from the original on 8 September 2017. ^ Fisher, Gary L. (2009). Encyclopedia of substance abuse prevention, treatment, & recovery. Los Angeles: SAGE. p. 564. ISBN 978-1-4522-6601-5. Archived from the original on 8 September 2017. ^ Narcotic Drugs Estimated World Requirements for 2008, Statistics for 2006. New York: United Nations Pubns. 2008. p. 77. ISBN 9789210481199. Archived from the original on 8 September 2017. ^ a b c d Narcotic Drugs 2014 (PDF). INTERNATIONAL NARCOTICS CONTROL BOARD. 2015. pp. 21, 30. ISBN 9789210481571. Archived (PDF) from the original on 2 June 2015. ^ a b Triggle, David J. (2006). Morphine. New York: Chelsea House Publishers. pp. 20–21. ISBN 978-1-4381-0211-5. ^ Karch, Steven B. (2006). Drug abuse handbook (2nd ed.). Boca Raton: CRC/Taylor & Francis. pp. 7–8. ISBN 978-1-4200-0346-8. ^ Davis’s Canadian Drug Guide for Nurses. F.A. Davis. 2014. p. 1409. ISBN 978-0-8036-4086-3. ^ a b “Morphine Sulfate”. The American Society of Health-System Pharmacists. Archived from the original on 3 March 2011. Retrieved 3 April 2011. ^ Meine TJ, Roe MT, Chen AY, Patel MR, Washam JB, Ohman EM, Peacock WF, Pollack CV, Gibler WB, Peterson ED (June 2005). “Association of intravenous morphine use and outcomes in acute coronary syndromes: results from the CRUSADE Quality Improvement Initiative”. Am. Heart J. 149 (6): 1043–9. doi:10.1016/j.ahj.2005.02.010. PMID 15976786. ^ Sosnowski MA. “BestBets: Does the application of opiates, during an attack of Acute Cardiogenic Pulmonary Oedma, reduce patients’ mortality and morbidity?”. BestBets. Best Evidence Topics. Archived from the original on 16 June 2010. Retrieved 6 December 2008. ^ Wiffen PJ, Wee B, Moore RA (2016). “Oral morphine for cancer pain”. The Cochrane Database of Systematic Reviews. 4: CD003868. doi:10.1002/14651858.CD003868.pub4. PMID 27105021. ^ Schrijvers D, van Fraeyenhove F (2010). “Emergencies in palliative care”. Cancer J. 16 (5): 514–20. doi:10.1097/PPO.0b013e3181f28a8d. PMID 20890149. ^ Naqvi F, Cervo F, Fields S (August 2009). “Evidence-based review of interventions to improve palliation of pain, dyspnea, depression”. Geriatrics. 64 (8): 8–10, 12–4. PMID 20722311. ^ Parshall MB, Schwartzstein RM, Adams L, Banzett RB, Manning HL, Bourbeau J, Calverley PM, Gift AG, Harver A, Lareau SC, Mahler DA, Meek PM, O’Donnell DE (February 2012). “An official American Thoracic Society statement: update on the mechanisms, assessment, and management of dyspnea”. Am. J. Respir. Crit. Care Med. 185 (4): 435–52. doi:10.1164/rccm.201111-2042ST. PMC 5448624. PMID 22336677. ^ Mahler DA, Selecky PA, Harrod CG, Benditt JO, Carrieri-Kohlman V, Curtis JR, Manning HL, Mularski RA, Varkey B, Campbell M, Carter ER, Chiong JR, Ely EW, Hansen-Flaschen J, O’Donnell DE, Waller A (March 2010). “American College of Chest Physicians consensus statement on the management of dyspnea in patients with advanced lung or heart disease”. Chest. 137 (3): 674–91. doi:10.1378/chest.09-1543. PMID 20202949. ^ Mattick RP, Digiusto E, Doran C, O’Brien S, Kimber J, Henderson N, Breen B, Shearer J, Gates J, Shakeshaft A, NEPOD Trial Investigators (2004). National Evaluation of Pharmacotherapies for Opioid Dependence (NEPOD): Report of Results and Recommendation (PDF). Monograph Series No. 52. Australian Government. ISBN 978-0-642-82459-2. Archived from the original (PDF) on 10 October 2012. ^ Thompson DR (April 2001). “Narcotic analgesic effects on the sphincter of Oddi: a review of the data and therapeutic implications in treating pancreatitis”. Am. J. Gastroenterol. 96 (4): 1266–72. doi:10.1111/j.1572-0241.2001.03536.x. PMID 11316181. ^ a b c d e f Furlan AD, Sandoval JA, Mailis-Gagnon A, Tunks E (2006). “Opioids for chronic noncancer pain: A meta-analysis of effectiveness and side effects”. Canadian Medical Association Journal. 174 (11): 1589–1594. doi:10.1503/cmaj.051528. PMC 1459894. PMID 16717269. ^ Stefano GB, Zhu W, Cadet P, Bilfinger TV, Mantione K (March 2004). “Morphine enhances nitric oxide release in the mammalian gastrointestinal tract via the micro(3) opiate receptor subtype: a hormonal role for endogenous morphine”. J. Physiol. Pharmacol. 55 (1 Pt 2): 279–88. PMID 15082884. ^ Calignano A, Moncada S, Di Rosa M (December 1991). “Endogenous nitric oxide modulates morphine-induced constipation”. Biochem. Biophys. Res. Commun. 181 (2): 889–93. doi:10.1016/0006-291X(91)91274-G. PMID 1755865. ^ Brennan MJ (March 2013). “The effect of opioid therapy on endocrine function”. Am. J. Med. 126 (3 Suppl 1): S12–8. doi:10.1016/j.amjmed.2012.12.001. PMID 23414717. ^ Colameco S, Coren JS (January 2009). “Opioid-induced endocrinopathy”. J Am Osteopath Assoc. 109 (1): 20–5. PMID 19193821. ^ Kerr B, Hill H, Coda B, Calogero M, Chapman CR, Hunt E, Buffington V, Mackie A (November 1991). “Concentration-related effects of morphine on cognition and motor control in human subjects”. Neuropsychopharmacology. 5 (3): 157–66. PMID 1755931. ^ Friswell J, Phillips C, Holding J, Morgan CJ, Brandner B, Curran HV (2008). “Acute effects of opioids on memory functions of healthy men and women”. Psychopharmacology. 198 (2): 243–50. doi:10.1007/s00213-008-1123-x. PMID 18379759. ^ Galski T, Williams JB, Ehle HT (2000). “Effects of opioids on driving ability”. J Pain Symptom Manage. 19 (3): 200–8. doi:10.1016/S0885-3924(99)00158-X. PMID 10760625. ^ a b c Martin WR, Fraser HF (1961). “A comparative study of physiological and subjective effects of heroin and morphine administered intravenously in postaddicts”. J. Pharmacol. Exp. Ther. 133: 388–99. PMID 13767429. ^ a b National Institute on Drug Abuse (NIDA) (April 2013). “Heroin”. DrugFacts. U.S. National Institutes of Health. Archived from the original on 30 November 2005. ^ Roshanpour M, Ghasemi M, Riazi K, Rafiei-Tabatabaei N, Ghahremani MH, Dehpour AR (2009). “Tolerance to the anticonvulsant effect of morphine in mice: blockage by ultra-low dose naltrexone”. Epilepsy Res. 83 (2–3): 261–4. doi:10.1016/j.eplepsyres.2008.10.011. PMID 19059761. ^ Koch T, Höllt V (2008). “Role of receptor internalization in opioid tolerance and dependence”. Pharmacol. Ther. 117 (2): 199–206. doi:10.1016/j.pharmthera.2007.10.003. PMID 18076994. ^ “Why do We Quit ‘Cold Turkey’?”. Archived from the original on 21 November 2016. Retrieved 21 November 2016. ^ “Opiate Withdrawal Stages”. Archived from the original on 5 June 2014. Retrieved 13 June 2014. ^ Chan R, Irvine R, White J (1999). “Cardiovascular changes during morphine administration and spontaneous withdrawal in the rat”. Eur. J. Pharmacol. 368 (1): 25–33. doi:10.1016/S0014-2999(98)00984-4. PMID 10096766. 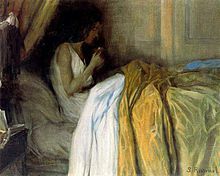 ^ “Morphine (and Heroin)”. Drugs and Human Performance Fact Sheets. U.S. National Traffic Safety Administration. Archived from the original on 3 October 2006. ^ Dalrymple T (2006). Romancing Opiates: Pharmacological Lies and the Addiction Bureaucracy. Encounter. p. 160. ISBN 978-1-59403-087-1. Archived from the original on 29 December 2010. ^ Anraku T, Ikegaya Y, Matsuki N, Nishiyama N (September 2001). “Withdrawal from chronic morphine administration causes prolonged enhancement of immobility in rat forced swimming test”. Psychopharmacology. 157 (2): 217–20. doi:10.1007/s002130100793. PMID 11594449. ^ O’Neil MJ (2006). The Merck index : an encyclopedia of chemicals, drugs, and biological. Whitehouse Station, N.J.: Merck. ISBN 978-0-911910-00-1. ^ DrugBank – Morphine Archived 11 July 2017 at the Wayback Machine Update Date: 11 July 2017. ^ Corbett, A. D.; Paterson, S. J.; Kosterlitz, H. W. (1993). Opioids. Handbook of Experimental Pharmacology. 104 / 1. pp. 645–679. doi:10.1007/978-3-642-77460-7_26. ISBN 978-3-642-77462-1. ISSN 0171-2004. ^ a b Codd EE, Shank RP, Schupsky JJ, Raffa RB (1995). “Serotonin and norepinephrine uptake inhibiting activity of centrally acting analgesics: structural determinants and role in antinociception”. J. Pharmacol. Exp. Ther. 274 (3): 1263–70. PMID 7562497. ^ King (25 October 2010). Pharmacology for Women’s Health. Jones & Bartlett Publishers. pp. 332–. ISBN 978-1-4496-1073-9. ^ Adriana P. Tiziani (1 June 2013). Havard’s Nursing Guide to Drugs. Elsevier Health Sciences. pp. 933–. ISBN 978-0-7295-8162-2. ^ Ogura T, Egan TD (2013). “Chapter 15 – Opioid Agonists and Antagonists”. Pharmacology and physiology for anesthesia : foundations and clinical application. Philadelphia, PA: Elsevier/Saunders. ISBN 978-1-4377-1679-5. ^ Yekkirala AS, Kalyuzhny AE, Portoghese PS (2010). “Standard opioid agonists activate heteromeric opioid receptors: evidence for morphine and [d-Ala(2)-MePhe(4)-Glyol(5)]enkephalin as selective μ-δ agonists”. ACS Chem Neurosci. 1 (2): 146–54. doi:10.1021/cn9000236. PMC 3398540. PMID 22816017. ^ Yekkirala AS, Banks ML, Lunzer MM, Negus SS, Rice KC, Portoghese PS (2012). “Clinically employed opioid analgesics produce antinociception via μ-δ opioid receptor heteromers in Rhesus monkeys”. ACS Chem Neurosci. 3 (9): 720–7. doi:10.1021/cn300049m. PMC 3447399. PMID 23019498. ^ a b “MS-Contin (Morphine Sulfate Controlled-Release) Drug Information: Clinical Pharmacology”. Prescribing Information. RxList. Archived from the original on 15 May 2007. ^ Kelly, E (August 2013). “Efficacy and ligand bias at the μ-opioid receptor”. British Journal of Pharmacology. 169 (7): 1430–46. doi:10.1111/bph.12222. PMC 3724102. PMID 23646826. ^ Chien CC, Pasternak GW (1995). “Sigma antagonists potentiate opioid analgesia in rats”. Neurosci. Lett. 190 (2): 137–9. doi:10.1016/0304-3940(95)11504-P. PMID 7644123. ^ Herman BH, Vocci F, Bridge P (1995). “The effects of NMDA receptor antagonists and nitric oxide synthase inhibitors on opioid tolerance and withdrawal. Medication development issues for opiate addiction”. Neuropsychopharmacology. 13 (4): 269–93. doi:10.1016/0893-133X(95)00140-9. PMID 8747752. ^ Loguinov A, Anderson L, Crosby G, Yukhananov R (2001). “Gene expression following acute morphine administration”. Physiol Genomics. 6 (3): 169–81. doi:10.1152/physiolgenomics.2001.6.3.169. PMID 11526201. ^ Messmer D, Hatsukari I, Hitosugi N, Schmidt-Wolf IG, Singhal PC (2006). “Morphine reciprocally regulates IL-10 and IL-12 production by monocyte-derived human dendritic cells and enhances T cell activation”. Mol. Med. 12 (11–12): 284–90. doi:10.2119/2006-00043.Messmer. PMC 1829197. PMID 17380193. ^ Clark JD, Shi X, Li X, Qiao Y, Liang D, Angst MS, Yeomans DC (2007). “Morphine reduces local cytokine expression and neutrophil infiltration after incision”. Mol Pain. 3: 1744–8069–3–28. doi:10.1186/1744-8069-3-28. PMC 2096620. PMID 17908329. ^ Trescot AM, Datta S, Lee M, Hansen H (2008). “Opioid pharmacology”. Pain Physician. 11 (2 Suppl): S133–53. PMID 18443637. ^ Kilpatrick GJ, Smith TW (2005). “Morphine-6-glucuronide: actions and mechanisms”. Medicinal Research Reviews. 25 (5): 521–44. doi:10.1002/med.20035. PMID 15952175. ^ a b van Dorp EL, Romberg R, Sarton E, Bovill JG, Dahan A (2006). “Morphine-6-glucuronide: morphine’s successor for postoperative pain relief?”. Anesthesia and Analgesia. 102 (6): 1789–1797. doi:10.1213/01.ane.0000217197.96784.c3. PMID 16717327. Archived from the original on 1 December 2008. ^ a b c “Morphine, slow release (By mouth)”. University of Maryland Medical Center. Archived from the original on 22 December 2015. ^ a b “Dosing & Uses”. Medscape. Archived from the original on 31 October 2015. Retrieved 21 December 2015. ^ a b “EndLink: An Internet-based End of Life Care Education Program – Morphine Dosing” (PDF). Northwestern University. Archived (PDF) from the original on 4 March 2016. ^ Baselt RC (2008). Disposition of Toxic Drugs and Chemicals in Man (8th ed.). Foster City, CA: Biomedical Publications. pp. 1057–1062. ISBN 978-0-9626523-7-0. ^ Vandevenne M, Vandenbussche H, Verstraete A (2000). “Detection time of drugs of abuse in urine”. Acta Clin Belg. 55 (6): 323–33. doi:10.1080/17843286.2000.11754319. PMID 11484423. ^ Verstraete AG (April 2004). “Detection times of drugs of abuse in blood, urine, and oral fluid”. Ther Drug Monit. 26 (2): 200–5. doi:10.1097/00007691-200404000-00020. PMID 15228165. ^ Kapoor L (1995). Opium Poppy: Botany, Chemistry, and Pharmacology. United States: CRC Press. p. 164. ISBN 978-1-56024-923-8. ^ Vincent PG, Bare CE, Gentner WA (December 1977). “Thebaine content of selections of Papaver bracteatum Lindl. at different ages”. J Pharm Sci. 66 (12): 1716–9. doi:10.1002/jps.2600661215. PMID 925935. ^ Stewart O (2000). Functional Neuroscience. New York: Springer. p. 116. ISBN 978-0-387-98543-5. ^ “μ receptor”. IUPHAR/BPS Guide to PHARMACOLOGY. International Union of Basic and Clinical Pharmacology. 15 March 2017. Archived from the original on 7 November 2017. Retrieved 28 December 2017. Morphine occurs endogenously . ^ a b Poeaknapo C, Schmidt J, Brandsch M, Dräger B, Zenk MH (2004). “Endogenous formation of morphine in human cells”. Proceedings of the National Academy of Sciences of the United States of America. 101 (39): 14091–6. Bibcode:2004PNAS..10114091P. doi:10.1073/pnas.0405430101. PMC 521124. PMID 15383669. Without doubt, human cells can produce the alkaloid morphine. ^ Wang X, Li J, Dong G, Yue J (February 2014). “The endogenous substrates of brain CYP2D”. Eur. J. Pharmacol. 724: 211–218. doi:10.1016/j.ejphar.2013.12.025. PMID 24374199. Additionally, CYP2D is involved in the synthesis of endogenous morphine from various precursors, including L-3,4-dihydroxyphenylalanine (L-DOPA), reticulin, tetrahydropapaveroline (THP), and tyramine (Kulkarni, 2001; Mantione et al., 2008; Zhu, 2008). ^ Novak B, Hudlicky T, Reed J, Mulzer J, Trauner D (March 2000). “Morphine Synthesis and Biosynthesis-An Update” (PDF). Current Organic Chemistry. 4 (3): 343–362. CiteSeerX 10.1.1.515.9096. doi:10.2174/1385272003376292. Archived (PDF) from the original on 19 June 2012. ^ Michael Le Page (18 May 2015). “Home-brew heroin: soon anyone will be able to make illegal drugs”. New Scientist. Archived from the original on 13 April 2016. ^ Robert F. Service (25 June 2015). “Final step in sugar-to-morphine conversion deciphered”. Science. Archived from the original on 21 August 2015. ^ Galanie S, Thodey K, Trenchard I, Filsinger Interrante M, Smolke C (August 2015). “Complete biosynthesis of opioids in yeast”. Science. 349 (6252): 1095–1100. Bibcode:2015Sci…349.1095G. doi:10.1126/science.aac9373. PMC 4924617. PMID 26272907. ^ “Yeast-Based Opioid Production Completed”. 13 August 2015. Archived from the original on 7 September 2015. Retrieved 15 August 2015. ^ DeRuiter J (Fall 2000). “Narcotic analgesics: morphine and “peripherally modified” morphine analogs” (PDF). Principles of Drug Action 2. Auburn University. Archived (PDF) from the original on 11 January 2012. ^ a b c d e Lide DR, ed. (2004). CRC handbook of chemistry and physics: a ready-reference book of chemical and physical data (85 ed.). Boca Ratan Florida: CRC Press. ISBN 978-0-8493-0485-9. ^ “Morphine”. LHA Science Page. LaurenHill Academy. Archived from the original on 15 February 2005. ^ Gates M, Tschudi G (April 1956). 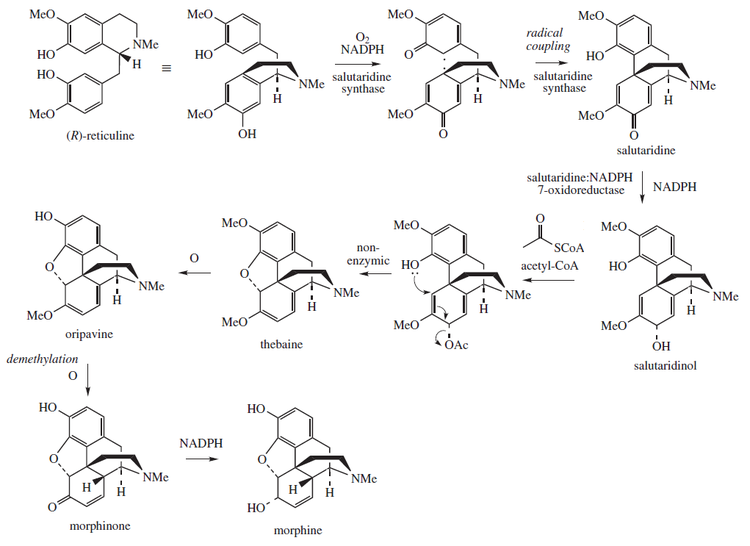 “The Synthesis of Morphine”. Journal of the American Chemical Society. 78 (7): 1380–1393. doi:10.1021/ja01588a033. ^ Rice KC (July 1980). “Synthetic opium alkaloids and derivatives. A short total synthesis of (+/-)-dihydrothebainone, (+/-)-dihydrocodeinone, and (+/-)-nordihydrocodeinone as an approach to a practical synthesis of morphine, codeine, and congeners”. The Journal of Organic Chemistry. 45 (15): 3135–3137. Bibcode:2007JOCh…72.1134P. doi:10.1021/jo01303a045. ^ Evans DA, Mitch CH (January 1982). “Studies directed towards the total synthesis of morphine alkaloids”. Tetrahedron Letters. 23 (3): 285–288. doi:10.1016/S0040-4039(00)86810-0. ^ Toth JE, Hamann PR, Fuchs PL (September 1988). “Studies culminating in the total synthesis of (dl)-morphine”. The Journal of Organic Chemistry. 53 (20): 4694–4708. Bibcode:2007JOCh…72.1134P. doi:10.1021/jo00255a008. ^ Parker KA, Fokas D (November 1992). “Convergent synthesis of (+/-)-dihydroisocodeine in 11 steps by the tandem radical cyclization strategy. A formal total synthesis of (+/-)-morphine”. Journal of the American Chemical Society. 114 (24): 9688–9689. doi:10.1021/ja00050a075. ^ Hong CY, Kado N, Overman LE (November 1993). “Asymmetric synthesis of either enantiomer of opium alkaloids and morphinans. Total synthesis of (−)- and (+)-dihydrocodeinone and (−)- and (+)-morphine”. Journal of the American Chemical Society. 115 (23): 11028–11029. doi:10.1021/ja00076a086. ^ Mulzer J, Dürner G, Trauner D (December 1996). “Formal Total Synthesis of(—)-Morphine by Cuprate Conjugate Addition”. Angewandte Chemie International Edition in English. 35 (2324): 2830–2832. doi:10.1002/anie.199628301. ^ White JD, Hrnciar P, Stappenbeck F (October 1999). “Asymmetric Total Synthesis of (+)-Codeine via Intramolecular Carbenoid Insertion”. The Journal of Organic Chemistry. 64 (21): 7871–7884. Bibcode:2007JOCh…72.1134P. doi:10.1021/jo990905z. ^ Taber DF, Neubert TD, Rheingold AL (October 2002). “Synthesis of (−)-Morphine”. Journal of the American Chemical Society. 124 (42): 12416–12417. doi:10.1021/ja027882h. PMID 12381175. ^ Trost BM, Tang W (December 2002). “Enantioselective Synthesis of (−)-Codeine and (−)-Morphine”. Journal of the American Chemical Society. 124 (49): 14542–14543. doi:10.1021/ja0283394. PMID 12465957. ^ Uchida K, Yokoshima S, Kan T, Fukuyama T (November 2006). “Total Synthesis of (±)-Morphine”. Organic Letters. 8 (23): 5311–5313. doi:10.1021/ol062112m. PMID 17078705. ^ Varin M, Barré E, Iorga B, Guillou C (2008). “Diastereoselective Total Synthesis of (±)-Codeine”. Chemistry: A European Journal. 14 (22): 6606–6608. doi:10.1002/chem.200800744. PMID 18561354. ^ Stork G, Yamashita A, Adams J, Schulte GR, Chesworth R, Miyazaki Y, Farmer JJ (2009). “Regiospecific and Stereoselective Syntheses of (±) Morphine, Codeine, and Thebaine via a Highly Stereocontrolled Intramolecular 4 + 2 Cycloaddition Leading to a Phenanthrofuran System”. Journal of the American Chemical Society. 131 (32): 11402–11406. doi:10.1021/ja9038505. PMID 19624126. ^ Michael Freemantle (20 June 2005). “The Top Pharmaceuticals That Changed The World-Morphine”. Chemical and Engineering News. ^ Klous MG, Van den Brink W, Van Ree JM, Beijnen JH (December 2005). “Development of pharmaceutical heroin preparations for medical co-prescription to opioid dependent patients”. Drug Alcohol Depend. 80 (3): 283–95. doi:10.1016/j.drugalcdep.2005.04.008. PMID 15916865. ^ Rapoport H, Lovell CH, Tolbert BM (December 1951). “The Preparation of Morphine-N-methyl-C14“. Journal of the American Chemical Society. 73 (12): 5900. doi:10.1021/ja01156a543. ^ Crews JC, Denson DD (1990). “Recovery of morphine from a controlled-release preparation. A source of opioid abuse”. Cancer. 66 (12): 2642–4. doi:10.1002/1097-0142(19901215)66:12<2642::AID-CNCR2820661229>3.0.CO;2-B. PMID 2249204. ^ Ramoutsaki IA, Askitopoulou H, Konsolaki E (December 2002). “Pain relief and sedation in Roman Byzantine texts: Mandragoras officinarum, Hyoscyamos niger and Atropa belladonna“. International Congress Series. 1242: 43–50. doi:10.1016/S0531-5131(02)00699-4. 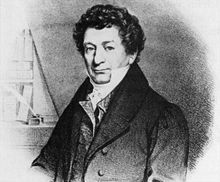 ^ Friedrich Sertürner (1805) (Untitled letter to the editor) Archived 17 August 2016 at the Wayback Machine, Journal der Pharmacie für Aerzte, Apotheker und Chemisten (Journal of Pharmacy for Physicians, Apothecaries, and Chemists), 13 : 229–243 ; see especially “III. Säure im Opium” (acid in opium), pp. 234–235, and “I. Nachtrag zur Charakteristik der Säure im Opium” (Addendum on the characteristics of the acid in opium), pp. 236–241. ^ a b Dahan A, Aarts L, Smith TW (2010). “Incidence, Reversal, and Prevention of Opioid-induced Respiratory Depression”. Anesthesiology. 112 (1): 226–38. doi:10.1097/ALN.0b013e3181c38c25. PMID 20010421. ^ Offit, Paul (March–April 2017). “God’s Own Medicine”. Skeptical Inquirer. 41 (2): 44. ^ Annual Register. J. Dodsley. 1824. p. 1. Archived from the original on 14 February 2013. Retrieved 1 September 2015. ^ Richard Davenport-Hines (2003). The Pursuit of Oblivion: A Global History of Narcotics. W.W. Norton. p. 68. ISBN 978-0-393-32545-4. ^ Vassallo SA (July 2004). “Lewis H. Wright Memorial Lecture”. ASA Newsletter. 68 (7): 9–10. Archived from the original on 2 February 2014. ^ “Opiate Narcotics”. The Report of the Canadian Government Commission of Inquiry into the Non-Medical Use of Drugs. Canadian Government Commission. Archived from the original on 4 April 2007. ^ Mandel J. “Mythical Roots of US Drug Policy – Soldier’s Disease and Addicts in the Civil War”. Archived from the original on 5 April 2007. ^ “Soldiers Disease A Historical Hoax?”. iPromote Media Inc. 2006. Archived from the original on 27 September 2007. ^ Winger G, Hursh SR, Casey KL, Woods JH (May 2002). “Relative reinforcing strength of three N-methyl-D-aspartate antagonists with different onsets of action”. J. Pharmacol. Exp. Ther. 301 (2): 690–7. doi:10.1124/jpet.301.2.690. PMID 11961074. ^ “Morphine Easy Home Cure”. Overland Monthly. 35 (205): 14. 1900. Archived from the original on 1 February 2014. ^ Dickman S (3 October 2003). “Marshall D. Gates, Chemist to First Synthesize Morphine, Dies”. Press Release. University of Rochester. Archived from the original on 1 December 2010. ^ Bayer, I. (July 1987). “[János Kabay and the poppy straw process. Commemoration on the 50th anniversary of his death]”. Acta Pharmaceutica Hungarica. 57 (3–4): 105–110. ISSN 0001-6659. PMID 3314338. ^ Zhu W, Cadet P, Baggerman G, Mantione KJ, Stefano GB (2005). “Human white blood cells synthesize morphine: CYP2D6 modulation”. J. Immunol. 175 (11): 7357–62. doi:10.4049/jimmunol.175.11.7357. PMID 16301642. ^ “List of narcotic drugs under international control” (PDF). Yellow List (PDF) (50th ed. ): 5. March 2011. Archived (PDF) from the original on 22 December 2014. ^ Miller, Richard Lawrence (1 January 2002). The Encyclopedia of Addictive Drugs. Greenwood Publishing Group. p. 306. ISBN 978-0-313-31807-8. ^ Milani, Barbara. Scholten (3rd ed.). Switzerland: World Health Organization. pp. 1–22. Archived from the original on 5 June 2018. Retrieved 17 January 2018. ^ Donald G. McNeil Jr. (10 September 2007). “Drugs Banned, Many of World’s Poor Suffer in Pain”. New York Times. Archived from the original on 11 May 2011. Retrieved 11 September 2007. Video: Intravenous morphine loading (Vimeo) (YouTube) – A short education video teaching health professionals the main points about intravenous loading of analgesics, in particular morphine.